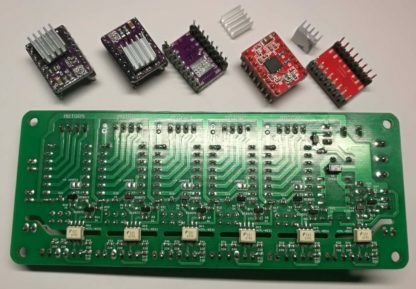 Home / Controller & Adapters boards / Theremino stepper driver controller board V2. Separate green LED for each Step and Line to indicate proper activity. 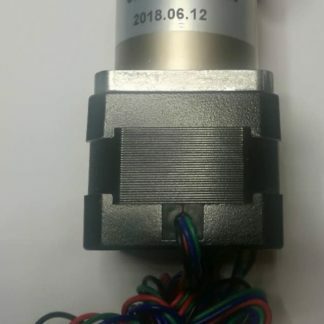 The connectors for the drivers are of high quality obtained on the lathe processing. Step, Direction for each driver, and Enable control interface is valid for all driver. 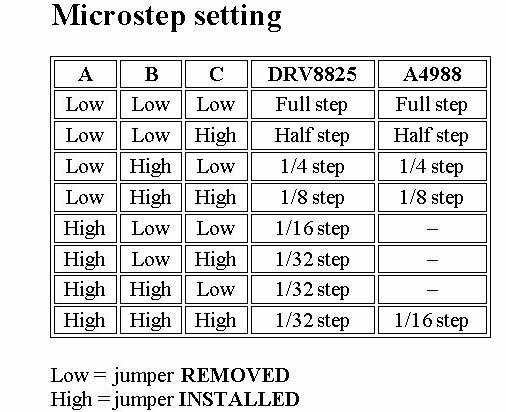 Three jumpers pin to select the step resolutions (microstepping). LED status indicators for Step and Dir for each driver. Carry different types of stepper drivers like Drv8825, DRV8824, A4988 and other similar driver that are pin compatible. 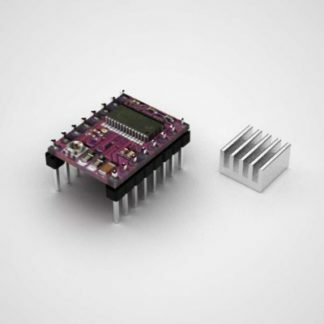 Completely opto-insulated, it provides a true galvanic isolation between the power circuit of the steppers and the circuit of the Theremino Master. Maintain separate the masses of the inputs from the masses of power. Power: from 8 to 36 volts, (we recommend not to exceed 32 volts for overheating the drivers and excessive thermal dissipation). MOSFET output, you must dimension the load taking account of these currents shall be up to about 16 Ampere. A connector (on the left) reports the positive supply voltage and connections to two MOSFET. Maximum voltage tolerated by the MOSFET is 60 volts but is better not to exceed 50. Maximum current bearable by the MOSFET is 20 amperes (without heatsink). 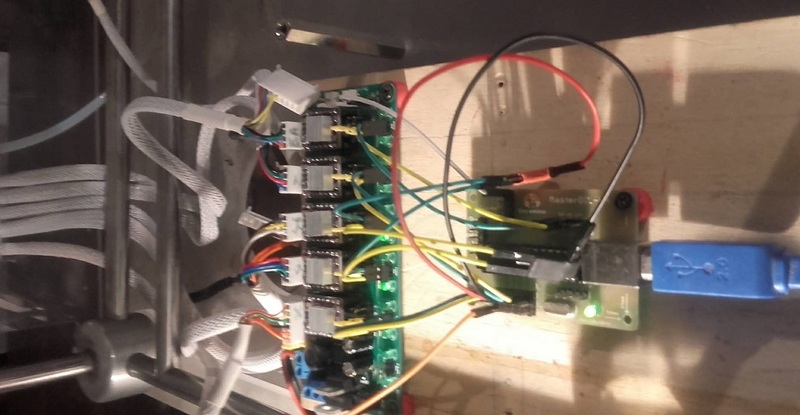 The MOSFET can be controlled in PWM. We recommend that you use no more than 20 KHz in order not to increase their dissipation. MOSFET switching times are less than 100 NS. Photo-Coupler delay is 800 NS. Screw clamps for stepper motor cables. 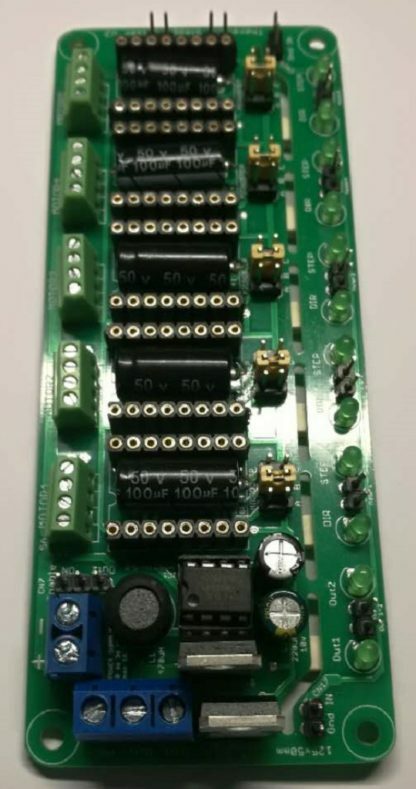 PCB with slots for high insulation. 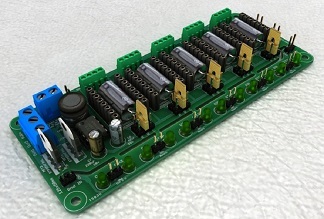 This stepper motor controller allows to insert up to five driver to power up to five motors. 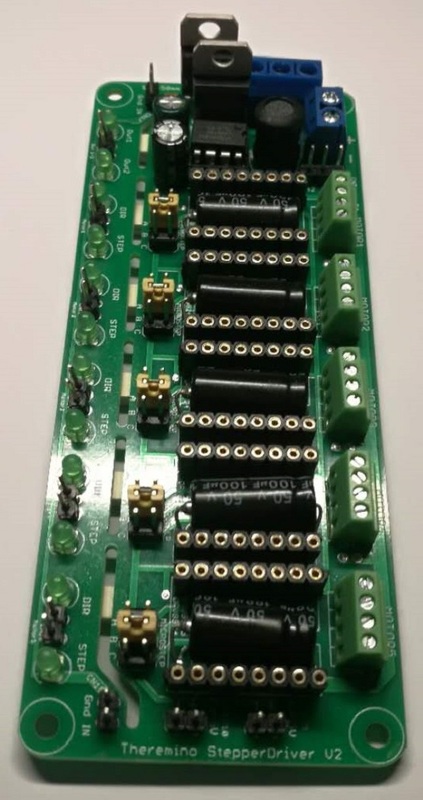 Have two MOSFET to drive any kind of load. 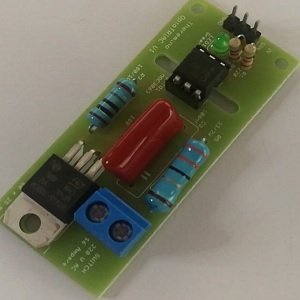 This MOSFET can be driven by the Theremino Master using the PWM in order to manage the power in output..
a 3D printer ( to see the photo click here, to see a video click here). Is perfect to build a 3D printer managed directly by Windows 10.
manage a special CNC with hot wire to cut polystyrene and adjust the wire temperature in PWM. You can install in this controller different types of drivers (DRV8825, DRV8824, A4988 and other similar driver that are pin compatible). There are the dimensions for the holes of the PCBA.